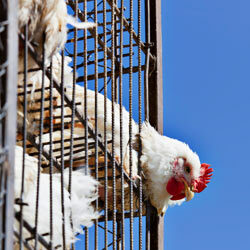 Tell Tim Hortons to stop using inhumane animal product suppliers! McDonald's and Kentucky Fried Chicken aren't the only offenders when it comes to animal cruelty at their factory farms. Fast food chain Tim Hortons is the next restaurant to come under fire for buying eggs and meat from suppliers who do not utilize humane methods when it comes to their farm animals. Though the chain itself isn't directly involved in raising the animals, the act of purchasing from them all but legitimizes their practices and implies, "We as a company simply don't care about the welfare of animals." Turning a blind eye to the cruel treatment of animals doesn't make Tim Hortons any less responsible. There are many companies who have pledged to use supplies who utilize human method, and there's no reason Tim Hortons can't do the same. Write to Tim Hortons telling them to join the trend and stop using inhumane suppliers! Many restaurants across America have adopted humane animal treatment strategies by switching to egg and meat suppliers who don't use gestation crates or other harmful methods. But Tim Hortons is behind the curve. The fast food chain still buys its products from factory farms who keep their hens in battery cages and their pigs in gestation crates. Animals in these types of enclosures cannot move or stretch their legs, and often adopt self-mutilating habits out of boredom or discomfort. What results is unhealthy animal products being consumed by the American public. Get with the times Tim Hortons! Stop using inhumane suppliers.